Here's an idea to highlight a day set aside to celebrate Fettuccine Alfredo from my Let's Celebrate post earlier this week. I've listed a couple of my favorite variations on the "recipe" I like and both are low carb since I'm watching my carb intake. 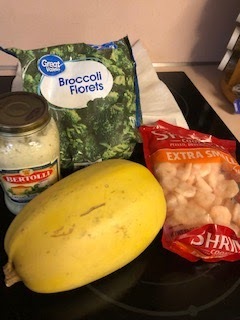 Prepare the spaghetti squash by boiling or the oven method and pull out the center with a fork. Set aside in a large serving bowl. 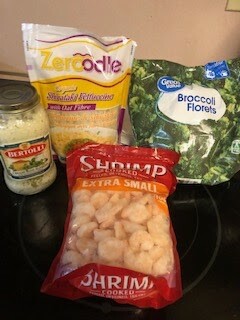 Bring the water to a boil, toss in the broccoli, and cook 3 - 5 minutes. You can adjust the time depending on how crisp you like your veggies. Toss in the shrimp, cooking another couple of minutes. Remove from heat, drain, and add to the "spaghetti". 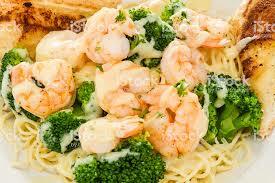 Pour the desired amount of Alfredo sauce over the ingredients and toss. To make the prep time shorter, you can skip the spaghetti squash and use a bag of Zerodles. Just follow the prep directions on the bag.